There are many reasons to buy an iPad 10 Things That Were Harder Before the iPad 10 Things That Were Harder Before the iPad Since its launch in 2010, the iPad has driven a revolution in personal computing. Even when you're using a Surface Pro 3 or Samsung Galaxy tablet, the iPad is still at the back of your... Read More , but few are as nerdy as the pursuit of a digital comic book reader 8 Places To Buy Comics Online, Whether You Like It On Paper Or Digital 8 Places To Buy Comics Online, Whether You Like It On Paper Or Digital I am presuming here that you the reader are now an adult or at least in your late teens who is probably reading at least a Dan Brown or the latest bestseller on political philosophy.... Read More . These days the comic book scene is very much alive and kicking on iOS. “Best — tablet — ever,” indeed. If you’re reading on Android be sure to check out our top picks 4 Android Apps For Reading Your PDF Comic Book Collection 4 Android Apps For Reading Your PDF Comic Book Collection Do you have comics saved in PDF format, or are you just looking for a good comic book reader? Check out these amazing Android apps. Read More for your platform, but today we’ll be limiting our search to apps found on Apple’s App Store. ComicFlow takes a free, simple, and open-source approach to reading digital comics. It’s probably the best place to start if you’re getting into digital comics, and it allows you to load up your iPad with .CBR, .CBZ and .PDF files before hitting the road. Organization is minimal — just put your comics into a folder, and they’ll be treated as a series. The reader is polished, reliable, pleasant to use, and even allows you to transfer comics via WiFi using a web server (or WebDAV server) that runs on your iPad. To use it, ensure the server is started by visiting the app settings, then on your computer, visit the supplied URL to drag, drop, and manage your collection. Unfortunately the feature is limited to 50 transfers, after which you’ll need to pay $4.99 via in-app purchase. With a focus on simplicity over features, ComicFlow provides a minimal toolset with which to read your collection of comic and graphic novel files. The app even promises to handle thousands of comics and tens of gigabytes of files without grinding to a halt. Bottom line: The best place to start your iPad comic book journey before deciding you need to upgrade. Just like ComicFlow above, iComix is another completely free solution with an emphasis on minimalism rather than complex features or customization. The app literally has two themes (light and dark), a simple library with a few tools for organizing your collection, and it places its main emphasis on downloading comics from cloud storage. There’s no handy WiFi transfer using a web browser, but if you’re using Dropbox, Google Drive, OneDrive, Box, or Pogoplug to store and download comics, this is the best free tool for the job, though you can also transfer files over iTunes File Transfer. The app only supports .CBR and .CBZ files Create CBR/CBZ Files To Distribute Your Comic Strip Or Graphic Novel Create CBR/CBZ Files To Distribute Your Comic Strip Or Graphic Novel The Internet has been kind to comic book creators (although piracy has inflicted a big dent in the profits of the major publishers) and web comics and sequential art tales created specifically for an online... Read More , so PDFs are out, but you can open supported files in iComix (from other apps) to automatically add them to your library. Bottom line: The best free choice if you depend on Dropbox, OneDrive, or other supported cloud services, and it also emphasises simplicity. YACReader literally stands for “Yet Another Comic Reader” and can be considered somewhat of a paid upgrade for those who need a little more than iComix or ComicFlow provides. The app supports .CBR, .CBZ, .ZIP and .RAR archives, and allows you to transfer your comics via Dropbox or iTunes File Transfer. The app really shines when combined with the free desktop version of YACReader for Mac, Windows, and Linux. If you’ve got a large collection already being managed on your main machine, you can connect YACReader for iPad and peruse or download comics straight to your tablet without the need for iTunes or Dropbox. YACReader is a step up in terms of customization options over free readers and even features a slick one-tap mode for quickly chewing through your favourite strips. Bottom line: If you’re already using YACReader on your computer, you’d be silly not to install this as it integrates beautifully and allows you to access your full collection on your iPad. Highly customizable and polished, iComics is a solution just like YACReader for those who demand more from their comic book reader. As testament to this, iComics supports more document formats than any other reader, comfortably munching through .ZIP, .CBZ, .RAR, .CBR, .7ZIP, .CB7, .TAR, .CBT, .LZH, .LHA, .EPUB, and .PDF file types. The app boasts some niche features including support for right-to-left reading, the ability to share individual comic pages over email and support for printing individual pages. You can organise your comics into collections and even restrict page zooming to cut off unsightly borders. iComics also places great emphasis on the reading experience, with “super smooth scrolling” between pages. Unfortunately iComics is a bit of a let down in terms of transfer options, with iTunes File Sharing and importing from other apps the only ways of populating your collection. WiFi transfer via a Web browser would be nice! Bottom line: Ideal if you need a reader that can handle strange file types with some great customization features but ultimately let down by limited file transfer methods. A premium product that has been in development for six years, Comic Zeal is mature and rich in features but may seem bloated to those with few demands from a reader. The $4.99 price tag guarantees you a huge range of features, including powerful organization tools — perfect for keeping large numbers of comics at your disposal. The app includes support for file transfer over WiFi using a Web browser, downloading from cloud services including Dropbox, Google Drive, and iCloud Drive, import via AirDrop and good old fashioned iTunes File Transfer. It’s worth mentioning that full WiFi transfer support in freebie ComicFlow will also set you back $5. In addition to seemingly endless customization, Comic Zeal includes a power-user feature called “The Slider” which makes it easy to organise, create reading lists, reorder comics, and easily access other powerful functions. It might be expensive, but it’s packed with features. Bottom line: Probably the most feature-rich comic reader out there, highly organised with some serious features for those who demand them. The iPad comic book community has lost a faithful servant in ComicBookLover, a comprehensive reader for both iPhone and iPad (with separate versions) that didn’t cost a thing. Though the apps are very much available on the App Store, both versions ceased working with the arrival of iOS 8 What's New In iOS 8? What's New In iOS 8? After last year's big iOS 7 redesign, you'd expect a muted iOS 8 announcement at this year's Worldwide Developer Conference – but you'd be wrong. Read More and only the iPhone version has seen an update since.
.@eduo Maintaining legacy support gets harder and harder as Apple deprecates APIs and offers new ones which save development time. Sorry! So unless you’d like to run an iPhone app on your iPad (for a comic book reader, that’s not a great idea) you’ll have to wait and see whether or not the project will spring back to life. The support forums have been “archived” (never a good sign), the Twitter feed has been silent since February, and users are reporting emails going unanswered. If you’d rather browse and buy your comics directly on your iPad, one of these apps might fit the bill instead. All are free, but all have in-app purchases or depend on money being exchanged at some point (though free content does exist). comiXology is probably the most recognisable name in the digital comic book game, providing access to Marvel, DC, Image Comics, IDW, Disney and more. The only problem is you can’t currently buy them in-app, but you can add them to your wishlist and buy using a Web browser (Safari on your iPad) or from a desktop. Why? Because Apple decided that if you want to offer purchases via an app, those purchases must be made through their infrastructure. As Apple swallows 30% of all purchases, comiXology chose to remove the functionality altogether. This doesn’t affect your ability to download all previously purchased items within the app, whenever you want. 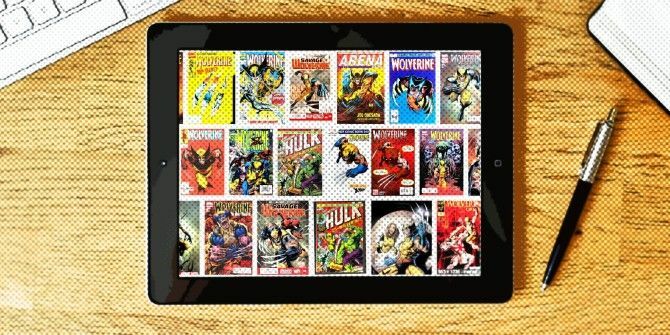 ComiXology also makes it onto the best apps and sites to read comic books on your Mac The 9 Best Apps and Sites for Reading Comic Books on Mac The 9 Best Apps and Sites for Reading Comic Books on Mac Love comics and want to read on your computer? Here are our favorite comic book readers for Mac. Read More . Comics Plus is a service just like comiXology that sells digital editions from Dark Circle, DC, IDW, Valiant, Vertigo and many more. Comics Plus differentiates itself from the pack by offering additional graphic novel rentals for 24, 48, or 120 hours (though not all available titles are included). All purchases take the form of in-app purchases, though you can also load the app up with your own comics as it has support for .EPUB, .PDF, .CBR and .CBZ via iTunes File Transfer. Comics Plus’ own “uView” comic assistant brings “community-created reading experiences” to your favourite comics. Another digital comic book store like comiXology and Comics Plus, Madefire Comics provides access to DC, IDW, Dark Horse, Oni Press, and publications from Top Cow in digital format. Madefire’s niche comprises of “Motion Books” — a flagship reading experience that brings comics to life with interactivity, sound, and animation. Included are some “choose your own adventure” tales, along with deviantArt integration that features fresh talent from the Web’s largest community of artists. Everything within the app is purchased as an in-app purchase, and you can download your entire catalogue within the app itself. What can be said about the apps supplies by comic publishers themselves? Most are fairly basic readers, with a store and library tacked-on with little organisation required on your part. While most of the companies selling their wares on the App Store release their comics to other stores (like comiXology), certain items are kept exclusive either permanently or for a temporary period. Fans with a tendency for certain publishers will get a kick out of these outlets, but for the casual fan having your collection spread across several different services isn’t particularly desirable. If that sounds like you then you should stick to .CBR/.CBZ readers or one of the other stores listed above. What app do you use to read comic books and graphic novels on your iPad? Explore more about: Comics, iPad, Reading. Chunky was the best and I paid for the upgrade to pro, but now it crashes on startup on an ipad 2. Even after deleting the entire library, uninstalling, and reinstalling. Too bad, because it was better than all the others. If this was to be a one-item list, it had to include Chunky. I love chunky but it crashes nonstop on my ipad 2/ios9.2. I switched to it from Comic Zeal. Still looking for something that doesn't crash much on an older device. Yeah, Chunky should have absolutely been on this list. Uhm, yeah Chunky kinda blows all of these out of the water really. It should have at least been on the list. I've tried a good portion of these, but a few months ago I discovered Chunky Comic Reader and it has become my default. Very nice with lots of features, and free.